The 505p-7 7 Pro Site is a Starrett Miter Saw Protractor model which is very durable, thanks to a very strong plastic which makes up its material. 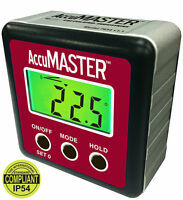 It has minimal errors with a great degree of accuracy for miter cuts while eliminating unnecessary calculations. The construction protractor is suitable for outdoor use with a laser engraved dial and two easy to read scales that makes it less complicated to use. Immediate payment of US $25.51 is required. It appears to be about 1/2 degree off at 45 degrees when compared to a measuring square. The arms on the protractor have a slight spring-back in the friction of the arms so to get the most accurate measurement you need to take your readings while holding the arms firmly to your measured surface. After some practice on scrap pieces I was able to compensate for the slight inaccuracy and it turned out to be a pretty useful tool. 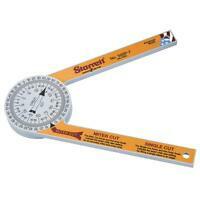 Great little protractor. Makes quick work of cutting crown molding with odd ball walls. It figures the cuts for you, you just set your saw and go. I had one of the first ones and someone "borrowed" it. So I have been so impressed I bought a second one. WELL made. One of many great products made by Starrett. Dial is easy to read. Arms are a good length for placing against saw blade and table. Very easy to use. Amazing product even though it's plastic. Very useful, good quality!